Posted August 17th, 2012 by Yvonne Hawkey & filed under Turntables, Well Tempered Lab. Well , well, well, what do we have here ? 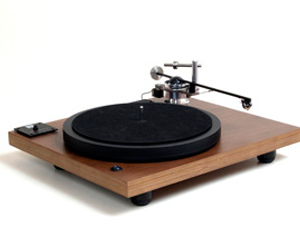 â€“ a Well Tempered turntable dressed in itâ€™s Sunday best. The Versalex is a real â€˜lookerâ€™ as they say and definitely more user friendly and â€˜houseâ€™ friendly than the brilliant but quirky Amadeus. The walnut veneered birch ply plinth is veryâ€¦. how shall we say, very Shahinian ??? However, donâ€™t fear analogue fans because beauty is most certainly more than skin deep with the Versalex, this turntable is definitely a Well Tempered and all the musical loveliness that they stand for. Bolt on a Dynavector and enjoy.